This book uses logical step-by-step procedures and examples from inception and risk appraisal—through design and construction to testing and commissioning—to show how an effective and dynamic time model can be used to manage the risk of delay in the completion of construction projects. Integrating with the CIOB major projects contract, the new edition places increased emphasis on the dynamic time model as the way to manage time and cost in major projects, as opposed to the use of a static target baseline program. It includes a new chapter distinguishing the principal features of the dynamic time model and its development throughout the life of a project from inception to completion. Guide to Good Practice in the Management of Time in Major Projects—Dynamic Time Modelling, 2nd Edition features new appendices covering matters such as complexity in construction and engineering projects, productivity guides (including specific references to the UK, Australia, and the USA), and a number of case studies dealing with strategic time management and high-density, resource-based scheduling. 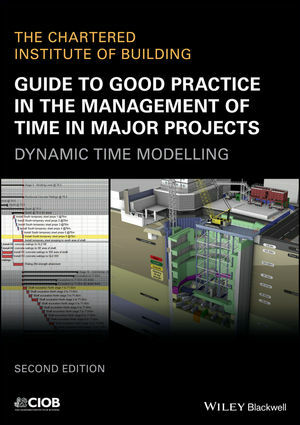 Guide to Good Practice in the Management of Time in Major Projects—Dynamic Time Modelling, 2nd Edition is an ideal handbook for project and program management professionals working on civil engineering and construction projects, including those from contractors, clients, and project management consultants. The Chartered Institute of Building is at the heart of a management career in construction. It is the world's largest and most influential professional body for construction management and leadership, with a Royal Charter to promote the science and practice of building and construction for the benefit of society. With over 46,000 members worldwide, the CIOB is the international voice of the building professional.